The GSD, as we know, is a wonderfully versatile, willing dog. He is a loyal pet who can shine in a wide range of activities. But what does it mean when we go back to breed standard and explore the dog’s basic instinct? Its herding instinct. 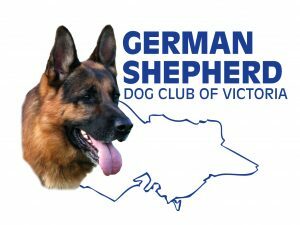 As yet there are only a few GSDs here fully committed to working and competing with stock, but the numbers are increasing as the sport itself develops. Herding is a new sport in Australia which is developing slowly in all the states. It is associated with the Canine Associations and is limited to dogs registered in the Working Dog category. There are 3 different courses that represent the strengths of the different types of working dog. A Course is a 3-5 sheep (or ducks or cows) linear trial through obstacles and is supposed to be the most generalized test of skills. It is the most popular course and is the one that most people do first. B Course is held in a larger arena and features a very wide cast. Dogs with naturally wide casts and strong gathering skills excel at this course. C Course uses 20-100 sheep and is designed for the European tending dogs. It is based on the French and German competitions. The handler takes the sheep along a route, crossing bridges, meeting traffic and grazing the sheep. It is leisurely and relaxed. The shepherd/handler is penalized for overly instructing the dog and the dog is penalized for breaking the slow, steady movement of the sheep. C course is the most natural course for the GSD. It is what he has been bred for and it is the Course that reveals the best in the dog. A working GSD in Germany is expected to work all day, moving continually and often covering up to 60 km. The flock might be close to 1000 strong and several dogs are working. So the shepherd is looking for a high drive dog that is physically sound, has steady paces, can learn and instigate what he has learnt independently, can work away from the handler, is co operative, is powerful enough to control the stock, is protective of the stock and is reliable. And of course that is what we see when we get a good GSD. He is powerfully built, he has a steady gait and can go all day, he has confidence, he wants to work with you and not against, and his temperament is solid. He will not be thrown out by surprises. Unfortunately the only state having regular C course trials at the moment is QSLD with Victoria putting on its first competition in 2011. Although there are several GSDs that have competed on A Course, it does not suit most GSDs. The GSD, especially a high drive dog, looks at 3-5 sheep and says “wow! !” The excitement level increases and the continual movement of 3-5 sheep only serves to stimulate. As well, the continual instructions from the handler often sets the GSDs teeth on edge as the handler pushes for more and more finesse around the obstacles. I have seen GSDs look dangerous to stock in a confined area (the round yard usually) although to the educated eye they may not be doing anything more than any other dog. I am certain they look like a wolf to the sheep. They are too big, too close and they have too much presence for only a couple of sheep. I have seen one lovely GSD female almost climb the walls of a round yard to get away from the sheep and give them room. Usually GSDs exert too much pressure and a novice handler becomes worried about his/her dog doing the wrong thing and ends up blocking the dog’s movement too much, causing even more excitement in a high drive dog. But put a GSD on many sheep, give him room and minimum instructions and what a different picture. The dog’s instinct kicks in. He understands the sheep’s relationship to the handler (the sheep MUST follow the handler, not be gathered by the dog). They are part of his team and he is happy to look after them (ie control) without always being told what to do. In C Course the handler is penalized for giving more than minimal instructions to the dog. The dog is expected to know how to do it (after our training of course!). AND HE DOES. This is his milieu, NOT three sheep running from him. After all, in Germany, he will be taking care of hundreds of sheep. I have become committed to herding because I am ALWAYS being quizzed. “You herd SHEEP with your GSD??! !” Well YES, HE IS A SHEPHERD DOG!! He does not work like a Collie or Kelpie but believe me he works sheep. Like them, the GSD has been bred for the conditions of his country. However, I have had to learn to handle a high drive dog working on instinct away from me. It certainly tests the novice handler when she takes her “pet” into an arena where he KNOWS more than she, WANTS more than she does and is working on the HARDWIRING of his ancestors. Take your GSD high drive male or female into an open space with sheep and you quickly learn how strong your leadership skills are and how good your dog language is. Suddenly those tiny misdemeanors at home become significant. Because it is absolutely true. Control and obedience in the field have everything to do with your understanding and leadership at home. That cute, mischievous kid can no longer be. Otherwise expect the finger when you go out to work!!! The GSD is wonderfully successful at a range of activities and I would argue that this is because the tending style as practiced by the Germans encourages those characteristics that give the dog the strength of character, intelligence, and tractability to go on to so many different fields of endeavour. The dog is expected to work independently. He must, because he is literally the other side of hundreds of sheep from the shepherd. He has to work to the shepherd’s wish. Therefore he has to be intelligent enough to learn quickly, respond appropriately and he must be genuinely cooperative. For those GSD owners and breeders who are concerned with maintaining the original characteristics of our GSD as a working dog I would offer reassurance and encouragement. The instinct and drive are still there and the GSDs are showing it in the instinct tests. At this stage of the sport we are all amateurs who have taken our dogs out to see how they go and have become hooked. None of us have selected a dog specifically for the task and only a few in the sport can say they are on their second generation dog. Certainly none of the GSD handlers. We are still learning the sport ourselves. BUT our dogs are in seventh heaven. They are working right where they know they should be and so long as we get it right we have a wonderful balance of independent and co operative work. And this working instinct is not contradictory to a well behaved, social dog in today’s world. Although the tending breeds have high drive, they also have high pack/obedience drive. It is this pack/obedience drive which makes them obedient to the border and willing to keep to their side of it. Having long been among the Australian Kelpie and the Blue Heelers I believe that the ideal working dog has a high drive that is matched by a willingness to work with and for you. A dog with “character” issues does not make a good working dog. If you don’t have co operation then too much time is spent arguing about who is running the show. Of course this does not mean that we don’t want dogs that are not strong. We want dogs that are strong and confident who are able to recognize leadership and respond to it. We want dogs who know that they can do it. But, having said this, another issue then arises. Are WE good enough for such dogs? Do WE have the leadership? I believe we do when we are genuinely interested in the DOG’s skills and I also believe we MUST be if we want to do justice to our dogs in herding. I suggest that to work with a dog at the cutting edge of his hunting drive handlers need to have two qualities – humility and openness to changing…themselves!!! We have to be ready to face the fact that the line between success and chaos is very, very thin when there are hapless humans, docile but tricky sheep and willing but trickier GSDs. Because C course is designed specifically for our type of dog I believe it is kinder on our high drive dogs. It works to their physical and emotional strengths so it becomes easier for the handler too. It is easier to work with the dog. But we still have to continually review our own skill levels, both within the sport and just as importantly as dog handlers. Do we really know how to work with a dog’s innate skill base and temperament? Herding in the tending style with a GSD means letting go of the direct control of the dog and becoming the team leader of the dog and sheep, sharing the management of the sheep with the dog. Of course, I say that if you have a high drive dog tending is the best and most rewarding activity you can do. But I am biased. However, I will say that because the dog does the work and has to do it over a sustained period (20-45mins in competition, hours in training) it can only be done well by sound (vital) dogs with tending drive. It is hard to keep a dog tending who does not have that innate want. I own siblings where one always wants to know what the sheep are up to and one who could not care less and I have learnt that we are talking about an innate response. We can switch on a dog’s instinct and develop his herding skills but in the end the quality of his work is in his own hands. He has to harness his energy and make his decisions to control the movement and well being of the flock. The magic is seeing a GSD do that, in tune with himself and his environment. In summing up, the GSD is a magnificent dog because of his willing work ethic, his loyalty and protectiveness and his intelligence. And so long as we continue to celebrate these characteristics in our dogs and nurture their physical and temperamental abilities as they were required by those German shepherds then our dog should continue to prosper as a Canine for All Seasons.